A collection of all the mini-expansions we’ve released! A mini-expansion is a small collection of cards (usually 3 to 8) following a simple theme. Every now and then, we get an idea in our heads for more cards we want to make, but it’s not big enough to qualify for a full-fledged expansion. So this is how we get the itch scratched! They’re all limited runs, and we will not always be carrying our full stock at conventions, but they will always be available here to print and play! All mini-expansions on this page are available from our Mini-Expansions Github repository. 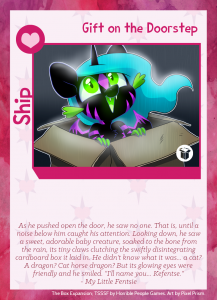 Check it out for text files containing all the card text, and the cards as image files fit for sending directly to a print shop! 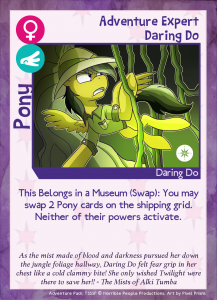 A collection of 3 cards representing all the awesomeness of Daring Do! 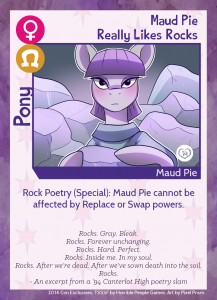 You even get a peek at her appreciation for Twilight’s style of prose! When the holidays are around, everyone wants to spend time with their parents. 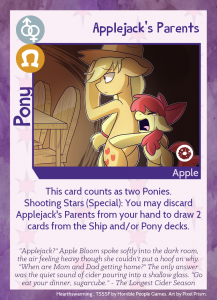 That’s why we’ve made this 8-card pack including all the Mane 6’s parents (or lack thereof)! Happy Holidays! Every year, we create one (or a few) exclusive cards for each convention we go to, as a special Thank You to everyone who visits us during that trip. 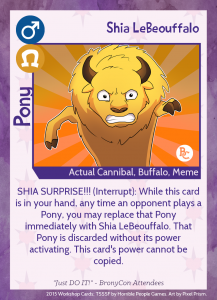 However, we don’t want to keep these cards hidden from the world forever, so every year we’ll release a mini-expansion of all the previous year’s promo cards! 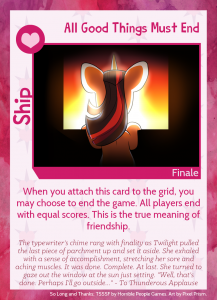 This 6-card pack is from the 2014 season, and includes the Indiegogo-backer only promo card as well! On April 1st, 2015, Pixel-Prism made the executive decision as Lead Artist to dramatically alter the style and tone of TSSSF, to take us in a brand new direction! This 4-card mini-expansion represents what she was able to get done before Mwai and Trick-Candle managed to pry the stylus from her claws and force her to actually get some sleep. The darkness holds many dangers, but Twilight and her friends are ready to face down the evils of the world for fame, glory, and phat lewt! Check out this 9-card D&D-themed mini-expansion! 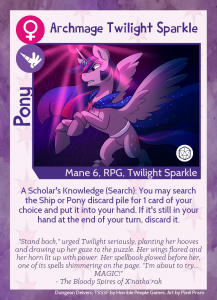 So, there’s this super-obscure pony that we really like. You may recognize her. Or not. Whatevs. Either way, here’s a 5-card expansion! Not all stories have a happy ending. 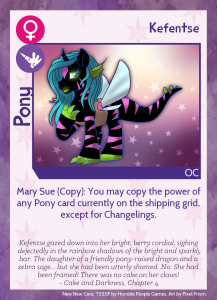 Add an element of darkness to your game with these Villain versions of the Mane 6! 2015 brings 7 new convention exclusive cards. You can download them here if you missed picking them up at a con! In 2015, we began hosting what we called the Make-A-Card Panel. 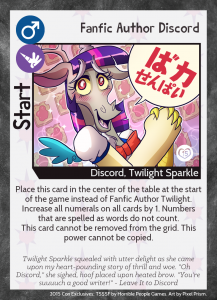 We would work with the audience to create a card that is 100% audience-inspired, and illustrated before the panel ended. 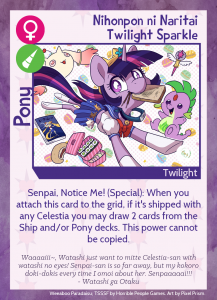 Now, you can download all the 2015 Panel cards in one mini-expansion! A rumor has been going around that our long boxes came with a special, limited-edition card. Surprisingly, those rumors were true! 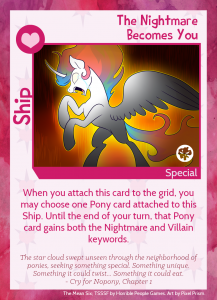 Our $50 Patreon patrons got a special treat: Every month, we would pick a few of them and make them a free TSSSF card of their choice! 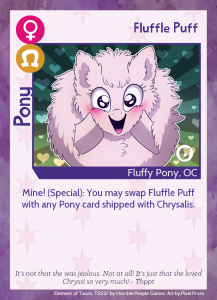 This pack is a collection of all the cards made, so graciously released to the public by our patrons! Note: This pack was split into two mini-expansions, due to issues with how we pack mini-expansions. Make sure to get both PDFs! It’s been a fun ride, but official development of TSSSF by Horrible People Games is over! However, that doesn’t mean that TSSSF itself is dead. Go out and make more of your own cards! Print the game! Share it with friends! Make a new game of your own inspired by it! Also, please enjoy this special card from the team at HPG as a Thank You to our loyal fans for all their attention!